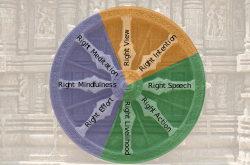 The Dhamma Chakra (also known as the wheel of Dhamma) is a symbol from ancient India and one of the Ashtamangala of Hinduism, Jainism, Buddhism. The Dhamma wheel symbol has represented Buddhism, Gautama Buddha's teachings and his walking of the path to Enlightenment since the time of early Buddhism. [note 1] The symbol is also connected to the Four Noble Truths and the Noble Eightfold Path. Ten Indus characters from the northern gate of Dholavira, dubbed the Dholavira Signboard. The wheel is also the main attribute of Vishnu, the Vedic god of preservation. Madhavan and Parpola note Chakra sign appears frequently in Indus Valley civilization, on several seals. Notably, in a sequence of ten signs on the Dholavira signboard, four are the chakra. In Unicode, as emoji: ☸️; as character U+2638 ☸ WHEEL OF DHARMA. Also an integral part of the emblem is the motto inscribed below the abacus in Devanagari script: Satyameva Jayate (English: Truth Alone Triumphs). This is a quote from the Mundaka Upanishad, the concluding part of the sacred Hindu Vedas. In the Bhagavad Gita too, verses 14, 15 and 16, of Chapter 3 speaks about the revolving wheel thus: "From food, the beings are born; from rain, food is produced; rain proceeds from sacrifice (yagnya); yagnya arises out of action; know that from Brahma, action proceeds; Brahma is born of Brahman, the eternal Paramatman. The one who does not follow the wheel thus revolving, leads a sinful, vain life, rejoicing in the senses." According to Harrison, the symbolism of "the wheel of the law" and the order of Nature is also visible in the Tibetan prayer wheels. The moving wheels symbolize the movement of cosmic order (ṛta). The image, having been found in antiquity is referred to as Rimbo (Treasure Ring) is an accepted symbol used in Nichiren Shoshu Buddhism. In the Vishnu Purana and Bhagavata Purana, two kings named Jadabharata of the Hindu solar and lunar dynasties respectively are referred to as "Chakravartins". Other "chakras" appear in other Indian traditions, e.g. Vishnu's Sudarśanacakra, a wheel-shaped weapon. The Flag of the Romani people also contains a 16-spoke red chakra in the centre, representing the itinerant tradition of the Romani people. In Falun Gong or Falun Dafa, the Fǎlún (法輪/法轮) is described as “an intelligent, rotating entity composed of high-energy matter.” Practitioners of Falun Gong cultivate this Law Wheel, which rotates constantly in the lower abdomen, the same focal point described as Lower Dāntián. ^ a b Grünwedel e.a. 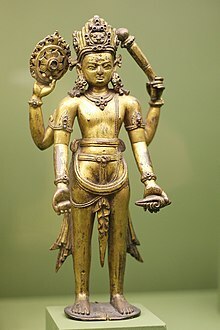 :"The wheel (dharmachakra) as already mentioned, was adopted by Buddha's disciples as the symbol of his doctrine, and combined with other symbols—a trident placed above it, etc.—stands for him on the sculptures of the Asoka period." ^ Monier Williams, A Sanskrit Dictionary (1899): "to hold, bear (also: bring forth), carry, maintain, preserve, keep, possess, have, use, employ, practise, undergo"
^ Goetz: "dharmachakra, symbol of the Buddhist faith". ^ "Buddhist Symbols". Ancient-symbols.com. Retrieved 22 June 2018. ^ a b c d Grünwedel 1901, p. 67. ^ Day 1982, p. 42-45. ^ a b c Beer 2003, p. 14. ^ "What is Shanti? - Definition from Yogapedia". Yogapedia.com. Retrieved 22 June 2018. ^ "Rajya Sabha Parliamentary Standing Committee On Home Affairs: 116th Report on The State Emblem Of India (Prohibition Of Improper Use) Bill, 2004" (PDF). Archived from the original (PDF) on 8 March 2013. ^ "THE BHAGAVAD-GITA" (PDF). Vivekananda.net. Retrieved 22 June 2018. ^ a b Goetz 1964, p. 52. ^ a b c Pal 1986, p. 42. ^ Harrison & 2010 (1912), p. 526. ^ a b "The national flag code" (PDF). Mahapolice.gov.in. Retrieved 22 June 2018. ^ Titze, Kurt; Bruhn, Klaus (22 June 1998). "Jainism: A Pictorial Guide to the Religion of Non-violence". Motilal Banarsidass. Retrieved 22 June 2018 – via Google Books.